This is the only feature phone you should buy in 2018. There’s so much one can do these days on a feature phone. Despite mobile phone brands coming up with dirt cheap phones, the demand for feature phones hasn’t diminished in India. This topic, whether India would give up feature phones easily could be debated for hours. But, we are not here for a debate. Rather we are here to tell you why Adcom X9 is the best feature you can buy at the price tag it retails for, which is INR 679 on Amazon India. 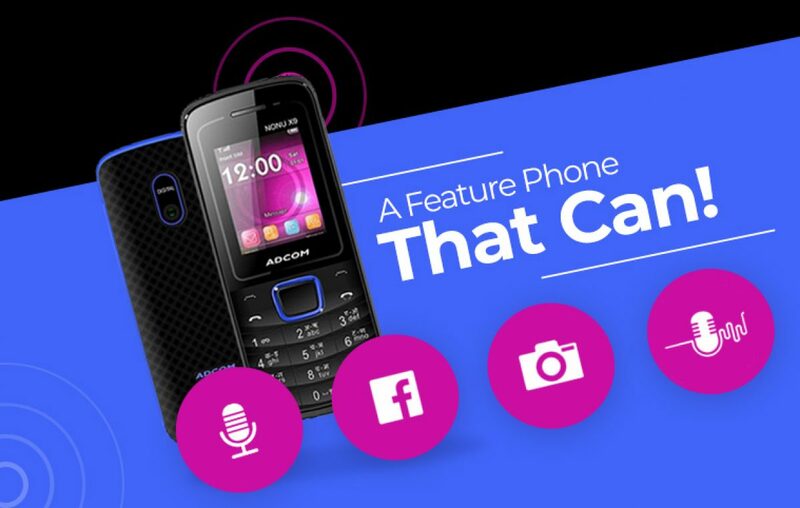 Let’s talk about the highlights of Adcom X9 specifications, which makes this feature phone in India worth buying. Feature phones are all about calling, texting, and long battery backup! That is the perception at large. But Adcom X9 changes that ideology of a feature phone. Most of us are familiar with the introduction of this one functionality; Voice Changer. This feature allows you to change your voice from male to female, and vice versa. Our voice is our identity. If a person on the other end doesn’t have your number stored and you want to fool them. Then, this feature could be of great use. This feature is not exactly the USP of the phone but indeed makes it stand out in the crowd of feature phones in India. These days there are a couple of things trending in the feature phone market. One of them is a requirement of a 4G feature phone. There are only select few phones with such functionality are present in the Indian mobile market. Unfortunately, they come with limited availability. One such other interesting feature in demand is ‘call recording’. But have you heard of any big players coming up with a feature phone with auto call recording? NO. Because they are busy adding more smartphones to their range than introducing actual resourceful basic devices. Adcom X9 addresses this requirement, which is ignored by incumbent players of the mobile industry. This feature has become must now, irrespective of the type of mobile phone you own. We all require immediate help at some point in life. This Panic button is the best way to inform your family and friends that you’re in danger and require immediate help. Once you press this button, your emergency contacts would be informed via the email that you require help. The feature phone will send an SOS as soon as you press the panic button. Yes! You understood right. Adcom claims to offer Facebook access to their tiny feature phone called the X9. Now which feature phone worth 679 offers accessibility to a social network. No other feature phone offers that except the Adcom X9. Of course, you won’t be able to enjoy all the Facebook features including videos and other stuff. But you may very well see what your friend’s and your favorite brands are up to via their text posts. Storing a media file on a feature phone? Well, who wouldn’t like that. With Adcom X9 that is also possible. Most of the feature phones don’t offer storage expansion on their mobiles. Those who do limit storage expansion to 2GB or 4GB. Adcom claims that its X9 comes with a support of up to 8GB microSD card. At least you’ll be able to store extra audio, video, and images. Why should I buy Adcom X9 feature phone in India? You’d find many feature phones in the market, but you won’t find a feature phone that offers such features mentions above and offers a great battery life. Which is why we recommend buying Adcom X9 if you are really looking forward to buying a feature phone in 2018. Previous article The Year 2017 in a Glimpse! Let's play the hits..
Xiaomi Mi 7 – A Futuristic Flagship you have been waiting for!